Paul Klee took the fugues of Bach as the model for his multi-layered paintings; Wassily Kandinsky's friendship with the avant-garde composer Schönberg encouraged the development of his free, expressive style; and later in the century, jazz became a model for artistic improvisation in the work of František Kupka, Alan Davie and others. 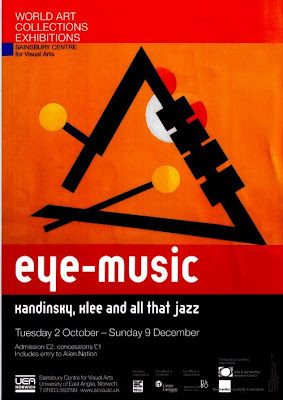 The poster above is for the exhibition Eye-Music - Kandinsky, Klee and all that jazz which opened at Norman Foster's Sainsbury Centre, here in Norwich, this week. I'll be talking to Sarah Bacon from the Sainsbury Centre about Eye-Music and other autumn exhibitions on our Community Chest programme on Future Radio tomorrow morning (Oct 5) at 10.00am. It looks to be a very interesting show. Other guests include the CEO of Norfolk's only whisky distillery and the opposing parties in a bitter dispute over plans to build a wind farm near our house on a former USAF airbase that featured here several years ago. We also have an item on last Saturday's Norwich Walk for Peace, plus music from Miles Davis and Joan Baez. (They wouldn't let us play Schoenberg, but read here about the first twelve-tone protest song). Click on the image below to listen in real time. 10.00pm UK time is very transatlantic unfriendly, but we're hoping to have podcasts available without the copyright music. And that mention of wind farms allow me to ask, again, how green was your concert? Other nominations for Important Intangible Cultural Properties are very welcome.